I didn't intend to take one. It just happened. 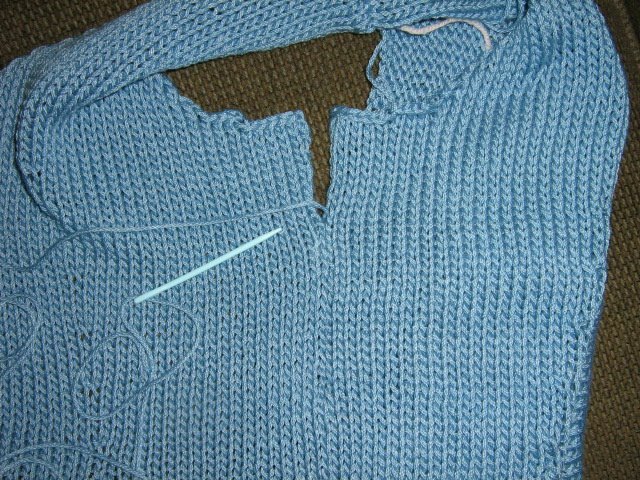 Don't you just hate it when life gets in the way of your knitting? Colin's sweater. I have only the right front to go and it will be finished. Notice the little pocket. I slipped a business card in there. 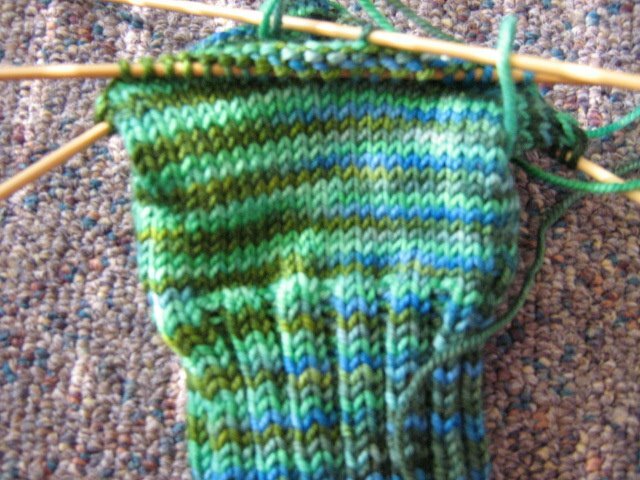 Oddly enough, I'm pretty sure this is the first time I did a pocket. Slick how that works. 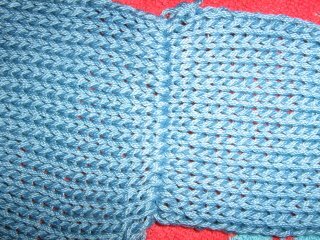 It looks kind of boring at this stage but I think it will be really cute with the red blanket stitch around it. As for Sizzle, I've had some comments about taking it in on the sides. I had that done last summer on two of my tops ( Knitty.com's Soleil) The results were ok but not great. I tried it on again this morning and a thought occurred to me. I think I can wear it under a jacket if I pin the hem in the back. I know that's not a very good solution, but I actually do wear a lot of jackets with sleeveless tops to work and I tend to keep the jacket on all day anyhow. At least I'd get some wear out of it that way. It has some really cute things in it. ( and one ridiculously hideous thing... you'll know it when you see it) For those of you who knit for kids, it has two toddler sweaters in it that are absolutely adorable. Check it out. On the home front, my son, who's old enough to know better, broke his hand last night playing tackle football with no protective gear on. He came in our room at 12:30 and said he was going to the emergency room. I gave him his insurance card and said ... have at it buddy. Sizzle- definitely looking like maternity wear. And what about this excess baggage under the arm? There definitely should have been some sort of shaping under the arm. As it is, the fabric sticks way out under there. Form fitting? I think not. It's in the dryer right now. I forgot to take a look before I left for work. Hopefully it shrunk. I'd love to be able to say, "Honey, I shrunk the Sizzle!" 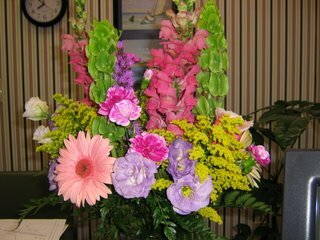 My birthday flowers. 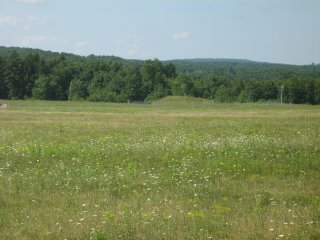 Pretty, huh? I love those Bells of Ireland. Our local florist uses them in almost every bouquet. I say that, but actually, maybe they just put them in the things we order because of our last name. They probably just think they SHOULD be in there. I got gift certificates for here and here. This is a positive thing. My family finally "gets" me. 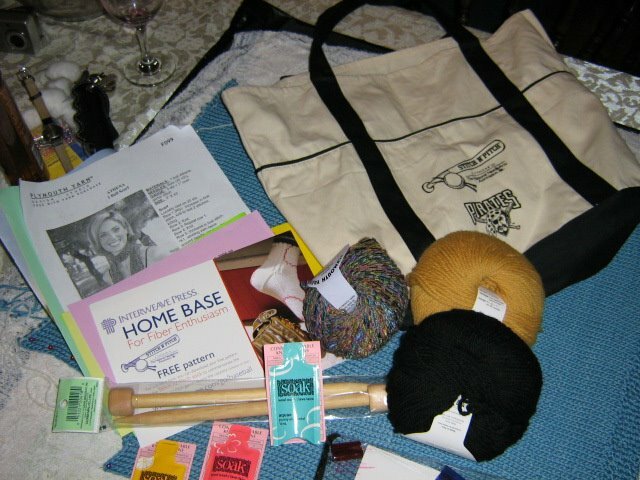 I'm thinking a few new books and lace weight yarn and maybe yarn for a Lady Eleanor shawl for me. Work is insane. I had to complain about another agent yesterday to her broker. I've never done that before. But in this business when you mess around and procrastinate doing your job, it messes with people's lives. I won't sit back and watch someone's laziness mess with my client's life. There's no excuse. I'm busy too. But you have to do what you have to do if it means missing dinner, or the kid's ballgame. We signed on for this. You have to get it done. Now, of course, every other dealing I have with her will be miserable because she'll have it out for me. But, having said that, the paperwork I've been looking for for a week was on my desk this morning when I got to work. Signed 4 days ago. No excuse. None. Cate is packing up her things today and taking a load to school. I'll miss her. She still needs a couch. I told her she can line up her kitchen chairs and pretend. We're going to have to find something somewhere. It's a Habitat For Humanity weekend for me. I'm working tomorrow and Sunday morning at a fundraiser for them at WalMart. Happy Happy Joy Joy. I love the cause. I hate the fundraisers. But, hey, I signed on for that. 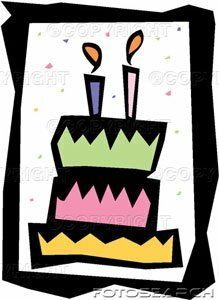 it's my birthday too yeah. Yeah, I'm old. Send sympathy. My sister's birthday is on Monday so we're getting together tonight for dinner. Should be fun. We have one of our nutso friends coming and we always have a good time together. 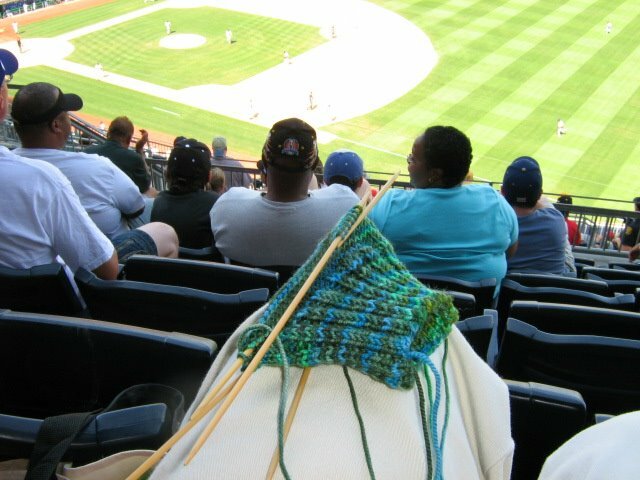 No knitting to report. Cate and I went to the Curve game last night and didn't get home until late. No knitting tonight either. 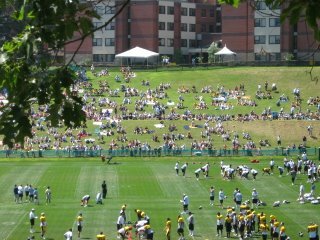 I should be in the throws of full withdrawal by tomorrow morning. I may have to call in sick. Sizzle is way too big. What is it with me and summer tops? Every one I have ever made is too big. 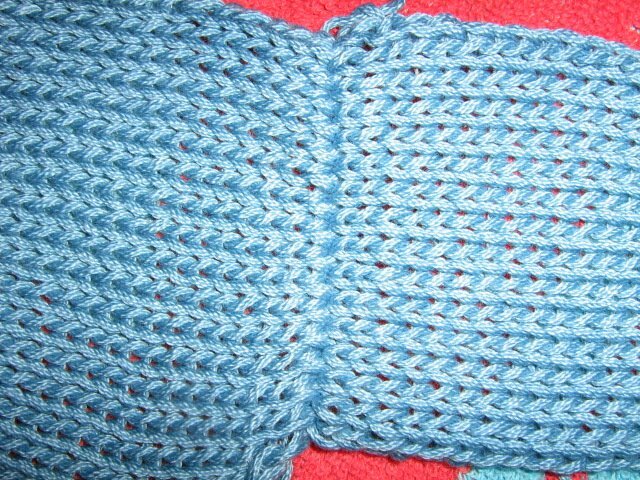 It still needs the seed stitch trim around the arm holes. I think I'll finish it and hope Kelly will wear it. As much as I like it, I'll definitely try it in a smaller size next summer. And it turned out not nearly as low cut as it shows in the photo on the pattern. Which is good. I thought I would have to wear a camisole under it but I really wouldn't have to. And, just to amuse you, here is Clifford, the big red dog, and Colin. Clifford made an appearance at my little nephew's birthday party on Sunday. 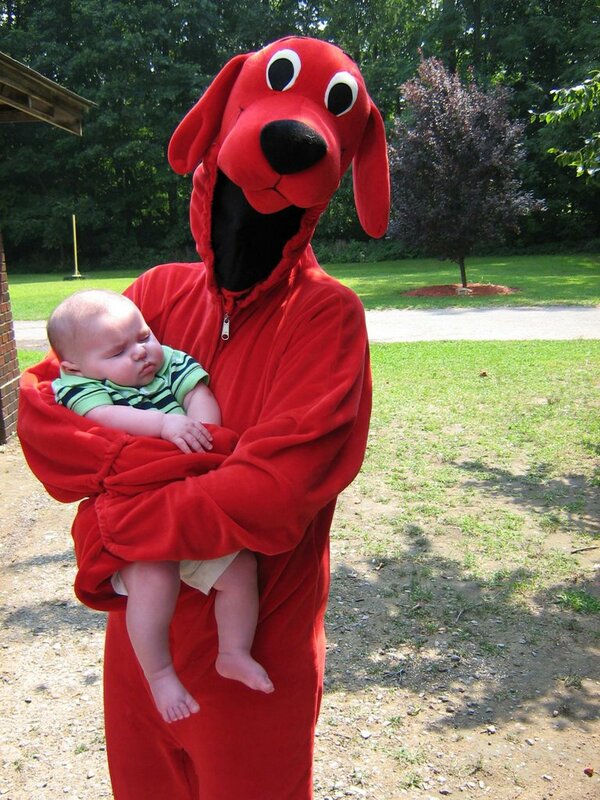 So guess who's in that Clifford suit?? Yep. There isn't anything I won't stoop to. My baby is 21 today. Where did the time go? 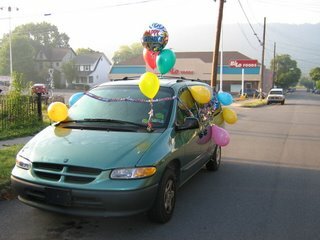 I am assuming that this is the handiwork of his girlfriend who must have made a visit in the middle of the night. 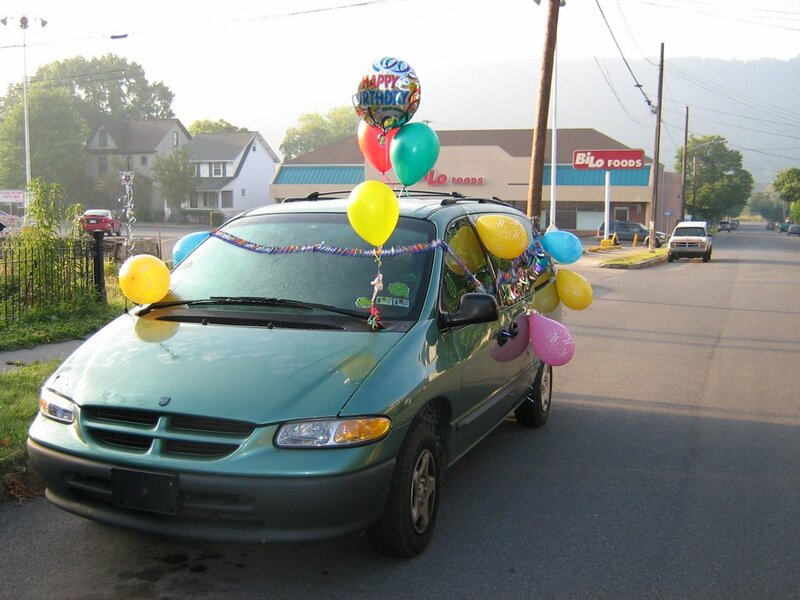 That poor van. It takes so much abuse. 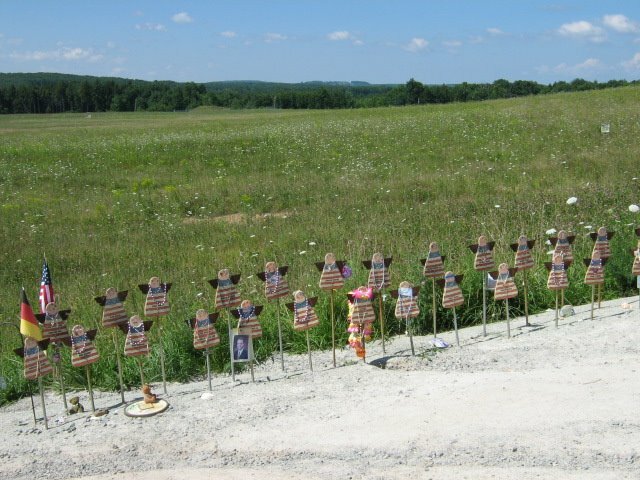 In the last year alone it's killed a deer, been stolen and made a few drug runs to Philly, gets treated like a dumpster day in and day out, and now the humiliation of tacky decor. It will welcome the relaxation of the junk yard some day. I worked on Trellis and Vine last night but I picked this up this morning before work and tried the mattress stitch again. As you can see, it's a nearly invisible seam with just a few little twists and turns in the road. The increases and decreases cause you to have to switch rows but it looks pretty good in my estimation. The only problem is, when you pull out on it, the seam does not look good. 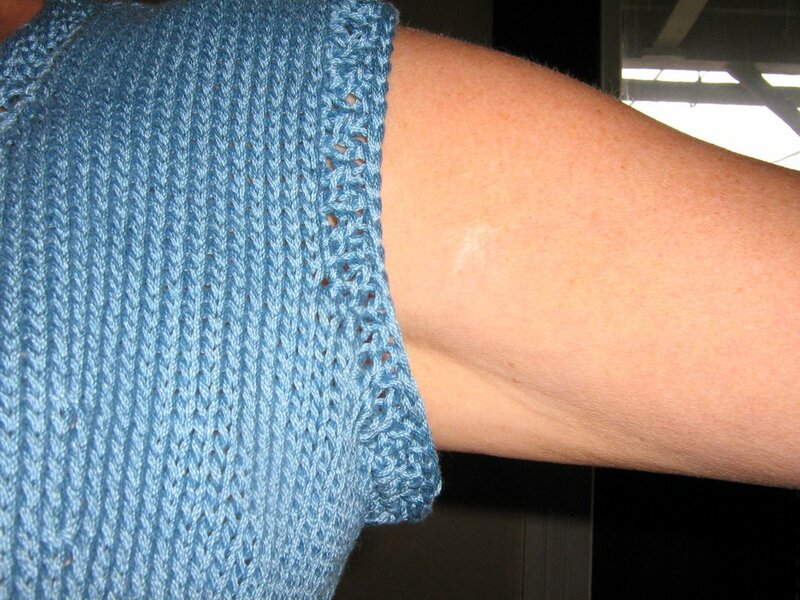 So, if it is tight fitting, which I don't know about yet, I may have to do the back stitch after all. This top is shorter on me than I had envisioned. 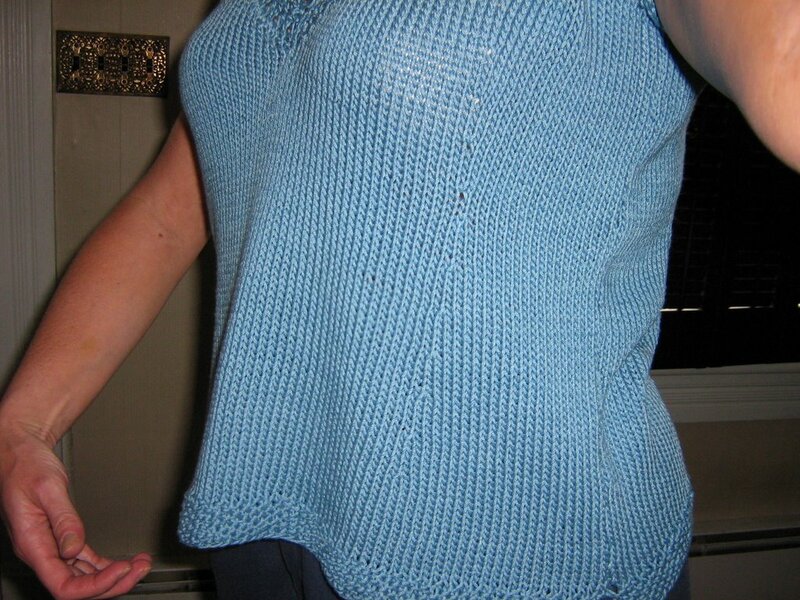 In Wendy's photos (knit and tonic), the top seems so much longer on her. My guess is that I have a long torso and that is what makes the difference. I still think it will be fine. T & V is coming along. It's fun to work on. The flash of my camera makes this blue look lighter than it actually is. 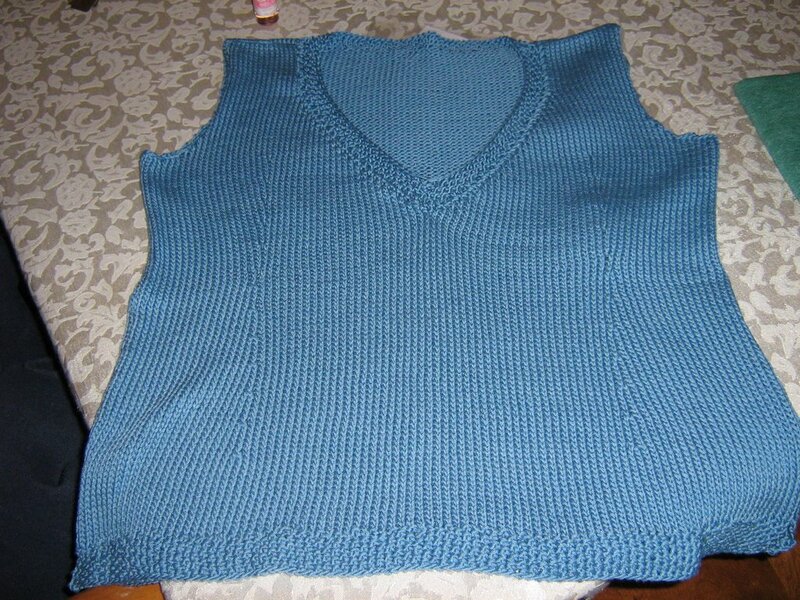 This is going to be great with jeans and a white blouse and also as a scarf with my winter coat. I know I should be working on Colin's sweater but I can't put this down at night. The big news around my office is that we are becoming a Howard Hanna franchise. 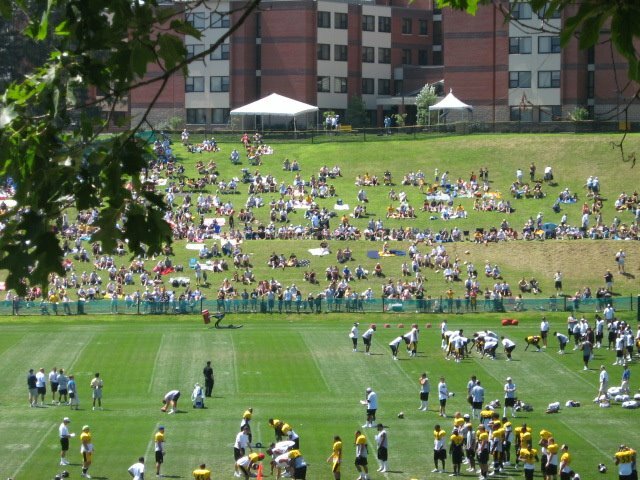 Those of you in the Pittsburgh area will be familiar. I'm pretty excited about it. Our independent office has always been regarded as more of a commercial/appraisal real estate office and we're hoping that this move will improve our residential sales business. I think it definitely will. My hope is that I'll become SO busy with work that I won't have time to knit. just kidding... c'mon, you know me better than that! Tonight is housework night because beginning tomorrow, it's all about watching Colin. My son-in-law's sister is getting married and they have a big weekend ahead. We'll watch him tomorrow during the rehearsal and dinner and then take him to the wedding on Saturday in his little kilt (and totally awesome highland socks) and then he's all ours until Sunday morning. I hope I have the stamina for all this! He's still not sleeping very well. 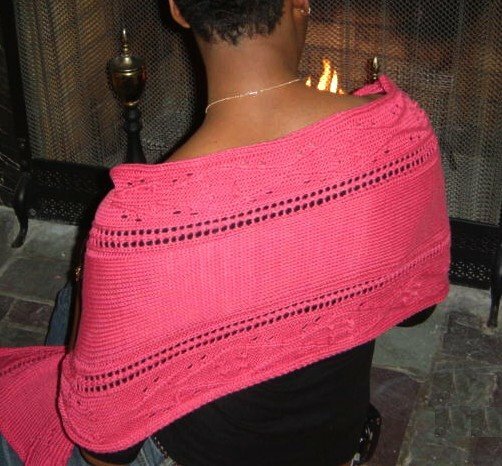 I want to get all my projects finished and start a lace shawl. I am determined. I can't get it out of my head and I am going to beat this thing if it's the last thing I do. I'd love to be able to take one to the beach in October but I don't think that's going to happen. 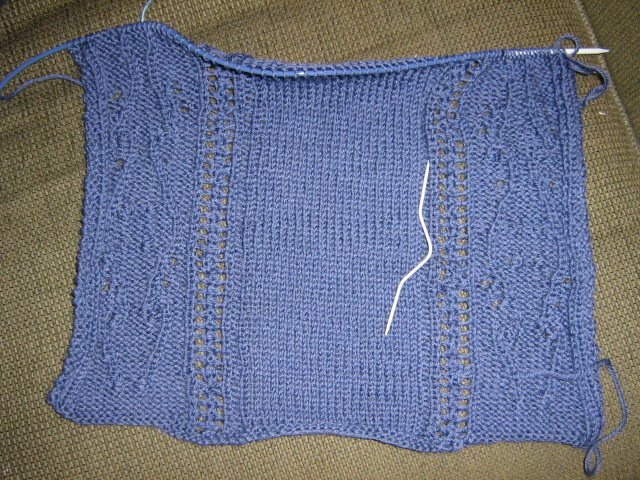 I can have the trellis and vine shawl done by then but that's not really what I want. 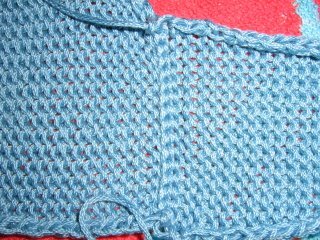 Why is lace so easy for some and so difficult for others??? 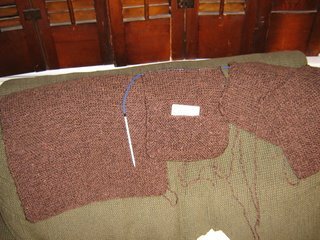 I worked on the brown garter stitch jacket for Colin last night. 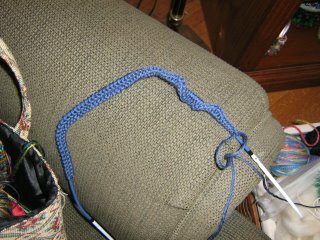 It's going to be cute but it's so boring to knit I almost have to put a gun to my head to pick it up. And speaking of Colin, here is his 3 month photo. The kid is cute. What can I say? I hit my head coming up out of a basement yesterday. I hit it hard. I actually saw stars. I'm not sure how I remained conscious. I realized that I had forgotten to turn a light out so I went back down and I was hurrying back up the steps. Some basements have this hideously low thing when you're coming up out of them. What were people thinking when they designed stupid things like that? It still hurts today. I've had a headache since I did it. Being a real estate agent is a dangerous job. According to statistics, there were 57 violent crimes committed against real estate agents in 2001 and 6 of them were fatal. I'm sure that number has risen in the last few years. But it's going to be the stupidity factor that gets me in the end. 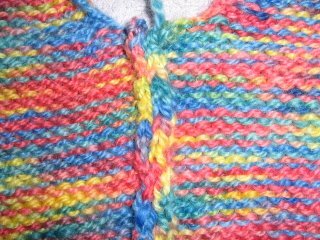 Here's proof that knitting with two balls of yarn does not prevent pooling. It just simply "stripes" the pooling. The little sweater is all finished. I'm not very happy with it. I think the sleeves are way out of proportion to the body of the sweater. And I had to add a row of crochet around the neck to try to pull it together. The neck was so big it wouldn't have have stayed on the hanger... or on the kid for that matter. 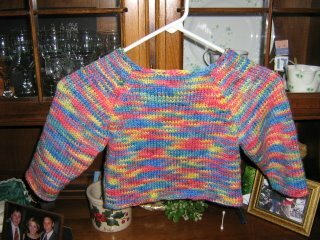 And, lastly, I knit to gauge and this was supposed to be a size 12 month. It's more like a 2T. Not one of Debbie Bliss's best efforts. The start of Trellis and Vine from Magknits. 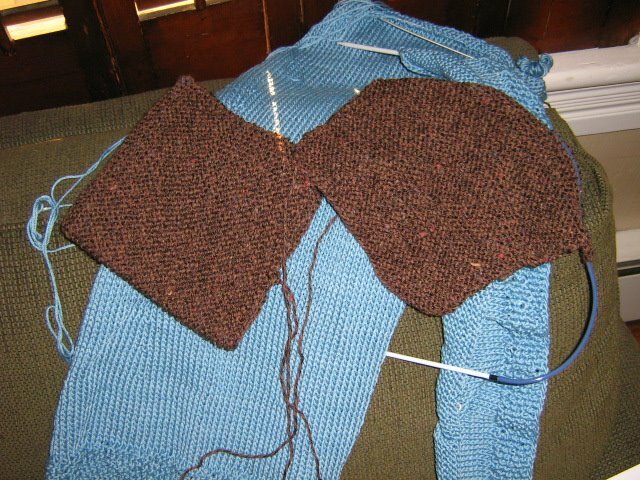 It has those two tiny strips of lace knitting, the exact same sequence of stitches every row, and I'm still biffing it up. I must be either forgetting yo's or not passing the stitch over on the skp's. Hopefully the blocking will hide the mistakes. I like the Jaeger Matchmaker yarn. Cate and I went to Stitch n Pitch yesterday... or is it Pitch n Stitch?? Well whatever it is, we had a good time. 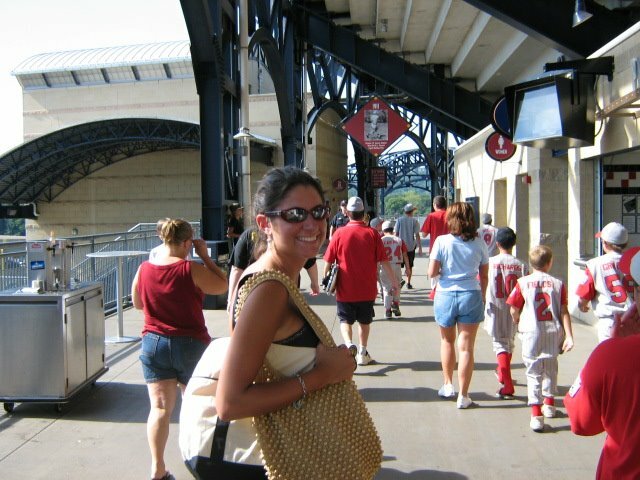 It took us a while to find the Stitch n Pitch table and get our bag of goodies and of course Cate had ants in her pants wanting to get to her seat so she could watch the Pirates warm up before the game. (I felt like I was with her father) The girl has her priorities all screwed up. Good Lord! You would have thought we went to watch BASEBALL! There was some really neat stuff in the bag. I'll be able to make Colin a cool Steelers hat with the yarn that was in there. And the bag itself is nice too. Yeah, we'll go back next year. 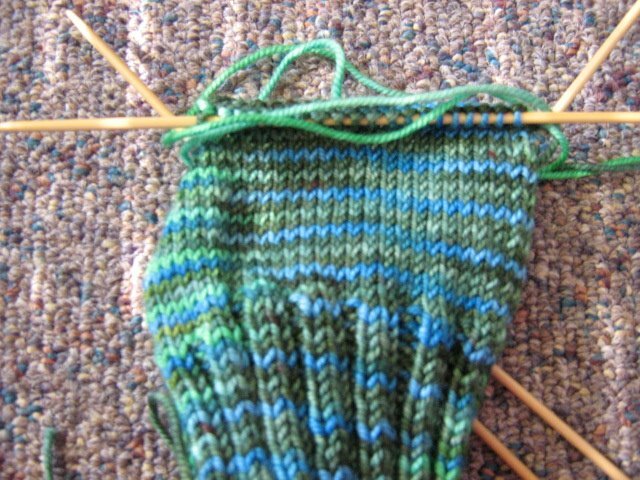 Socks That Rock in the County Clare colorway. 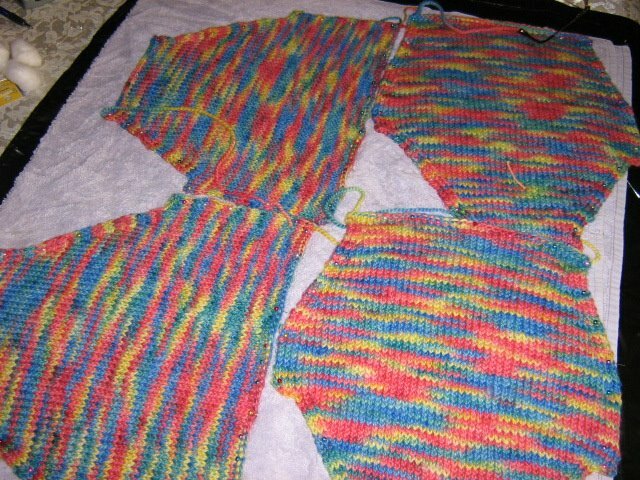 Yes, I'm using two balls of yarn this time to prevent pooling. You'll notice that we are sitting in peanut heaven. We (the knitters) had awesome seats but Catie and I moved to be out of the sun. It was just too darned hot. Anyone??? We're on our way. Why is it that every time I'm in the mood to clean, I have to walk out the door? Cate says no way. She's not goin in. Congratulations to Yvonne for being the only one who figured out that the princess would not wear dog poop earrings in this lifetime. (personally, I thought she'd get it too) She made a good point in stating that there is the possibility that it may have been chewed before it was swallowed and if she went through the disgusting task of retrieving it, only to find out that it wasn't wearable anyhow, she'd have to kill herself. Soooo..... Yvonne, something great will be on it's way to you soon! Many thanks to those of you who participated in the contest. It was fun. My sister is currently sitting in the Heathrow Airport waiting for a flight to the U.S. in the middle of all of this security madness. They confiscated her knitting!!! 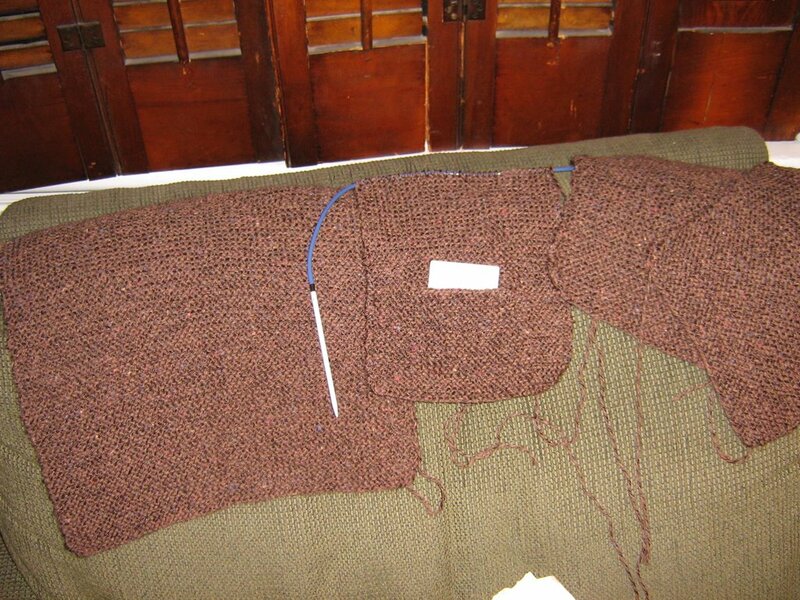 Last night I babysat Colin until 9:30pm so not much knitting happened. I did finish the baby socks while watching Project Runway. I will give them to our secretary today.... she's about 3 weeks and counting. Baby Levi will soon be here. 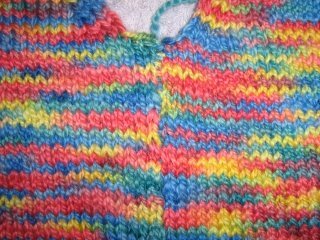 Since I didn't have a chance to do it last night, I picked up the baby sweater this morning and re-visited the mattress stitch to seam stockinette edges. It looks a little funky since the colors don't match but I think it's ok for my first try. Actually I may have done this before about 30 years ago but who could remember??? I hated to put it down to come to work. I was on such a roll. Ok, Project Runway last night. I was blown away by Angela's dress. I would so covet that dress if it wasn't so low cut. Modify that sucker a little and I'm all about it. It is simply gorgeous. The premise of last night's show was to design for a former fashion icon but modernize the look for today. Angela had Audrey Hepburn and she was dead on. I would love to have seen what Laura would have done with Audrey Hepburn. Her taste is more my taste. I think she would have also done a stellar job. She had Katherine Hepburn. I would wear what she designed. But it wasn't as awesome as Angela's dress. As for Bradley... what was he thinking??? I felt sorry for him. But, man, he just asked to get tossed with that one. Ok, I know I'm talking to myself here. What can I say? I just LOVE that show! I want to call each of these people and help them improve their resumes so they can get a job somewhere else. But there are way too many of them. 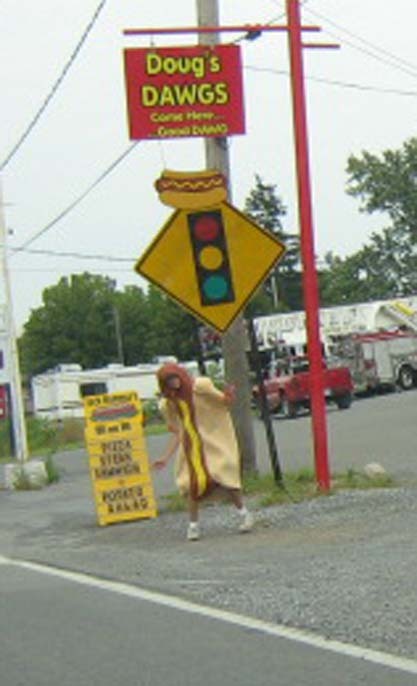 Actually, that is what I did when I worked at Manpower. People don't realize how much a bad resume hurts them. And bad grammar is the kiss of death. One of the most intelligent people I know had the most horrendous grammar when I met her as a colleague in a former job. She grew up in a little mountain community where everyone spoke that way. She never knew any differently. I don't know what goes on in those schools but I don't think that the teachers could compete with the home environment. Anyway, our boss took her aside one day and told her that if she wanted to climb the ladder of success, she better do something about her grammar and do it quickly. She didn't tell me at the time that he said that to her. She came to work a total mess for a few days and I knew that something was going on. Her eyes were bloodshot. I could tell she had been crying and not sleeping. She was quiet (and she was NEVER quiet) She finally told me what was said and that she had considered quitting because she was so upset. Instead, she ended up working really hard to correct her grammar and her career just soared from there. She has a very important job today. I wanted to kill that man at the time for hurting her like that. Turns out, it was the favor of a lifetime. FIRST OF ALL... ENTER THE CONTEST BELOW!! I'm hoping to get this finished for my husband for Christmas. He never asks for anything. I'd like to surprise him. Of course I have about 19 projects ahead of this one. I had hoped to get the baby sweater sewn up last night but it didn't happen. Maybe tonight while I watch Project Runway. I figure that's about a half hour job and then I'll work on the Trellis and Vine Shawl. God I love to knit. Why can't we get paid to knit??? For ourselves. Wouldn't life be awesome if that's how it worked? What we have here is an earring. A lone earring. It seems the other one has been eaten. Our dog eats jewelry. Some dogs eat socks and underwear (ZOE) and some dogs chew shoes. Our dog eats jewelry and always has. Fortunately for us, we don't have too much good jewelry to be eaten. The earring in question belongs to Cate. She purchased these earrings in Las Vegas. And while they aren't REAL diamonds, they have some sentimental value and, well, she just loves these earrings. So, last night, the boyfriend du jour decides to go out in the yard and check out the situation. Sure enough, earring found. (are you sufficiently grossed out yet??) So here's the question. Will she, or won't she retrieve the earring? Comment your yes or no answer to this post. 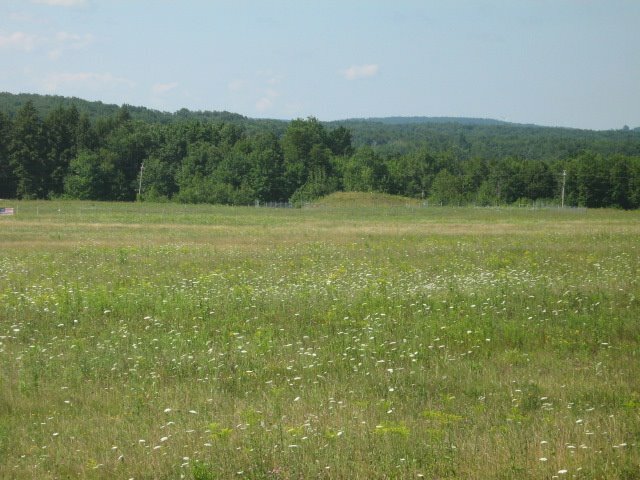 Post by midnight (Eastern Standard Time) on Thursday, August 10th. Those of you who have chosen correctly will be put into a drawing. Make sure your name is listed and your email address. What's the prize? Damned if I know. Yet. Above is a great photo of my STR yarn NOT pooled. 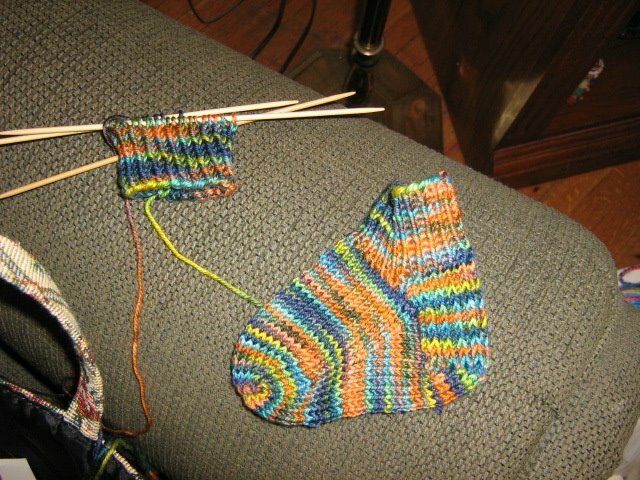 If you'll recall, when I made my socks, it pooled like crazy. 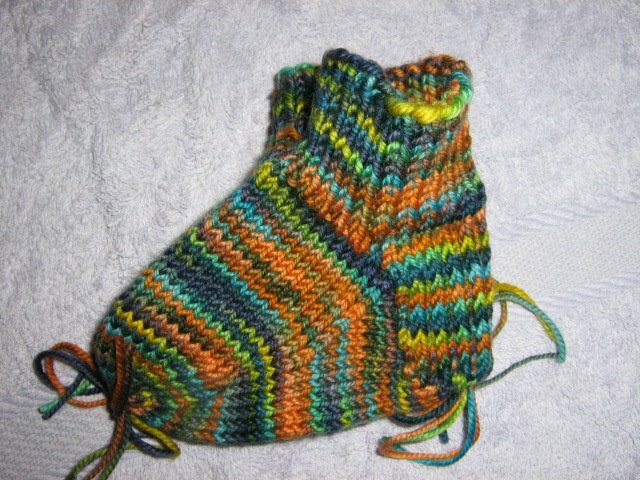 I'm making these little baby booties with the left over yarn. 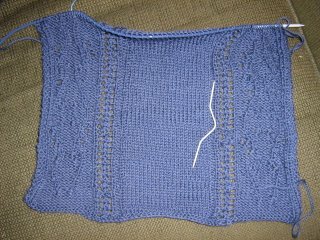 This is the start of the Trellis and Vine Shawl from Magknits. been broken for some time. Gotta get a new printer! 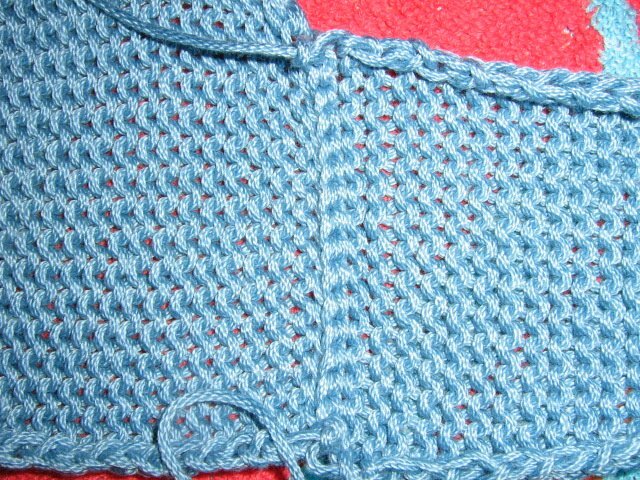 with the mattress stitch for this one. I'll have it done in time for Bedford Fall Foliage Shelly. I promise!! 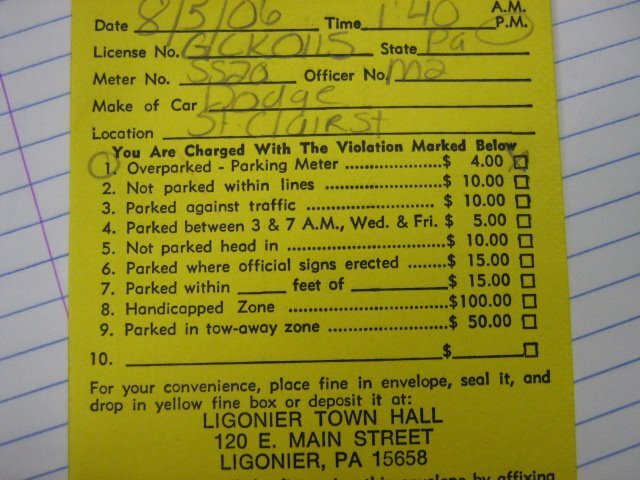 Below is a photo of the little present the Ligonier Police Department bestowed upon me on my car windshield on Saturday. In my little town, we don't have to feed the meters on the weekends. Parking is free. 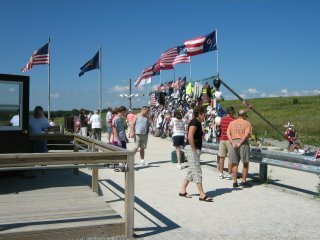 I guess our philosophy is that we're just happy to have people visit and shop on Saturday and Sunday. Silly me. I thought everyone did that! 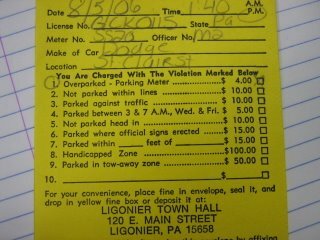 Apparently Ligonier is not so generous and forward thinking. Insanity!!! You would have thought it was game day. I'm not sure exactly what I expected but this wasn't it. Crazy. 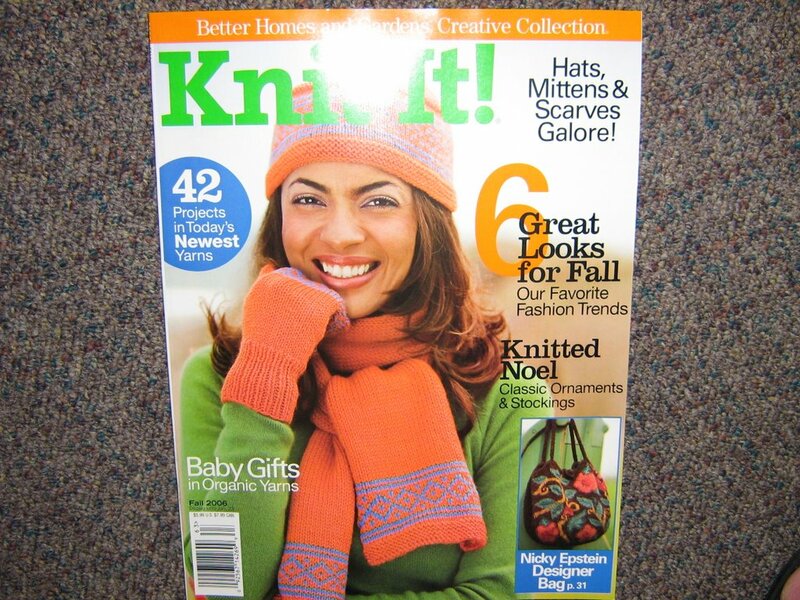 Now, on to what's most important.... KNITTING NEWS!!! 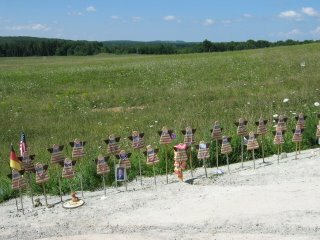 Yes, I made it to Kathy's Kreations in Ligonier. And, yes, I will be going back. Over. And Over. And Over Again!!! So much stuff, so little time. 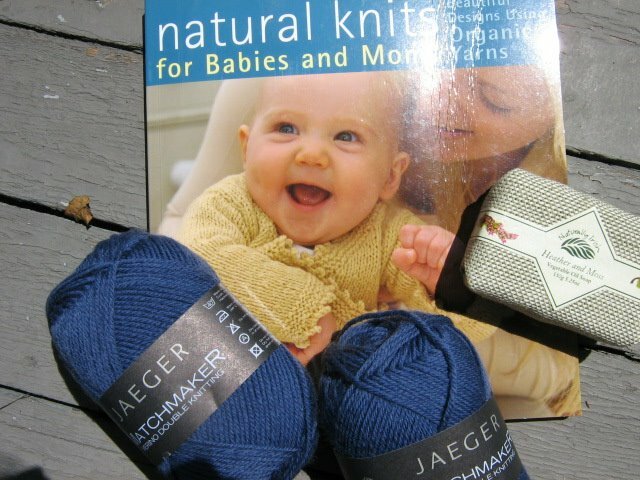 I got this book and 6 skeins of Jaeger Matchmaker Merino DK to make the Trellis and Vine shawl. I met Kathy and she was friendly and helpful. The books! Good Lord! If you can't find it there sister, you can't find it anywhere. The soap in the photo is from the little Celtic Culture store next to Kathy's. What a nice shop. I'll definitely make a trip back in there again too before Christmas. Nice guy. Nice stuff. We stayed at the Ligonier Country Inn. Just for the heck of it. The food there is outstanding. We'd go back just for dinner. The staff couldn't have been friendlier. We had several friendly chats with the employees. You can tell they enjoy working there. Dinner was excellent. Sunday brunch was just as excellent. 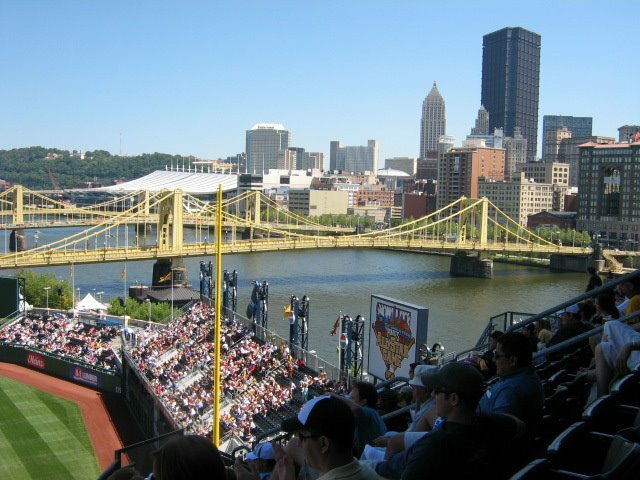 Every now and then when we just feel like escaping Blair County for a little while, we usually go to Pittsburgh. This was really different for us. I think my husband actually enjoyed it. I think he was surprised. He should listen to me more often. Oh. In strange baby news, Colin sat up today. 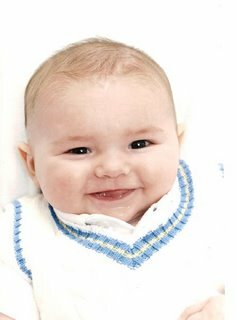 He will be three months old on Thursday. She had him laying on the couch and he sat up, stayed up for about 10 seconds and then fell over. He's been struggling to sit up for the past two weeks from a reclining position in his infant seat. It would seem that he finally found the abdominal strength to do it today. Weird! He hasn't even rolled over yet. If you go, don't leave without reading the cockpit transcript in the little hut. 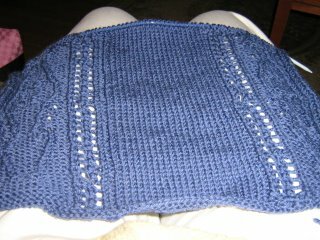 Since I really don't have enough going on the needles these days, I think I'm going to start this. 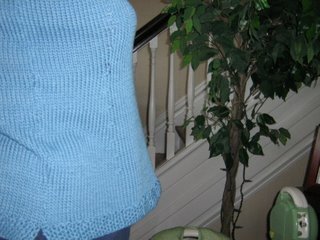 It's Trellis and Vine from Magknits. I've been wanting to do it for a long time and I was trying to decide what yarn to look for in Ligonier tomorrow and this popped into my head. The nice thing about this is that it can double as a scarf. So cute. Deciding what to work on these days is a tough decision. Last night I chose Sizzle while watching Project Runway. (Amazingly Angela designed something half way decent last night which surprised me) I love how Sizzle is turning out. Now if I can just get the neckline right I'll be thrilled with it. Knitting night at the assisted living facility was fun. We didn't have "company" this time though. A few of the residents stopped to say hello but no one joined us. 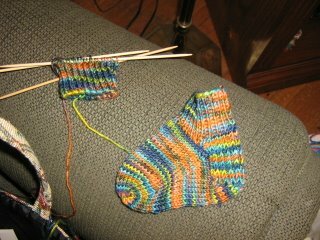 A few of the girls were working on their Gypsy Knits socks. They said that the mill that makes the cotton/elastic yarn for those socks is moving to India and the dyer is not going to be able to get it anymore. That's a bummer. I haven't used any of mine yet but it does look fun to knit with. I went shopping for clothes last night. Tried stuff on for two hours and left with NOTHING. I found a business suit I loved at Kaufmanns... awesome price... fit like a glove... and had a big grease mark on the back of it that I didn't notice until I took it off. I wish I had never put it on. And of course they didn't have another one in my size. The pants even fit. They were LONG enough. It was a miracle. I should have known not to get too excited. It's never that easy for me. 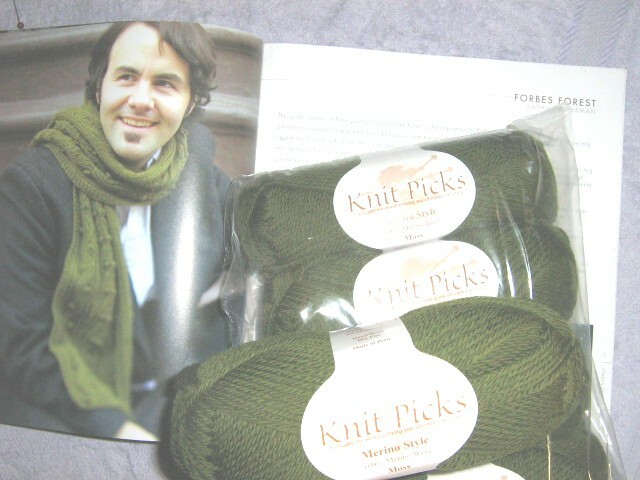 Check out the Forbes Forest scarf some guy knit. It's on the Scarf Style KAL site. It's awesome. Makes me want to try it. Interesting... I just overheard an elderly woman in our conference room saying that when she purchased her house, it was 6 months after a bill was passed allowing a WOMAN to purchase a home on her own. Before that, women could only purchase real estate in partnership with a man. Can you believe that?? She said women could inherit and own a home, but not purchase on their own. Geesh! We've come a long way baby. Thank God. 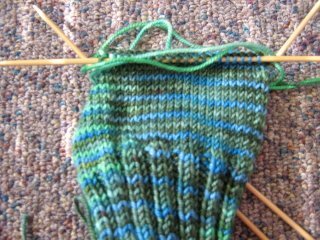 Since I don't have any of my own knitting that is interesting enough to display, I'll show you my sister's first knitting project in about 35 years. 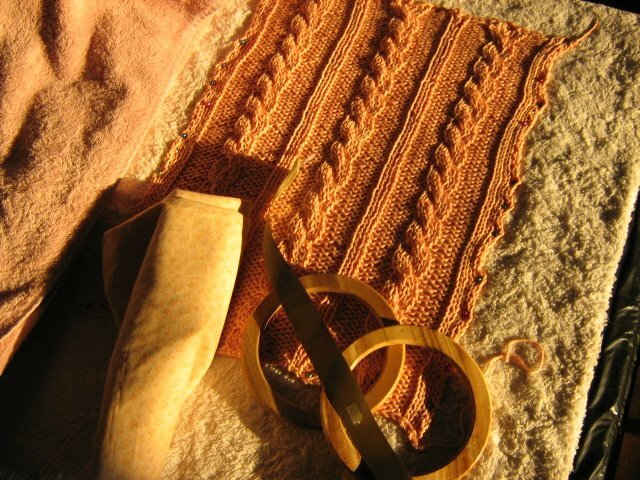 She is doing a peach cotton Erin Bag in Kertzer Butterfly. It turned out great. I'm telling you, it's like riding a bicycle. 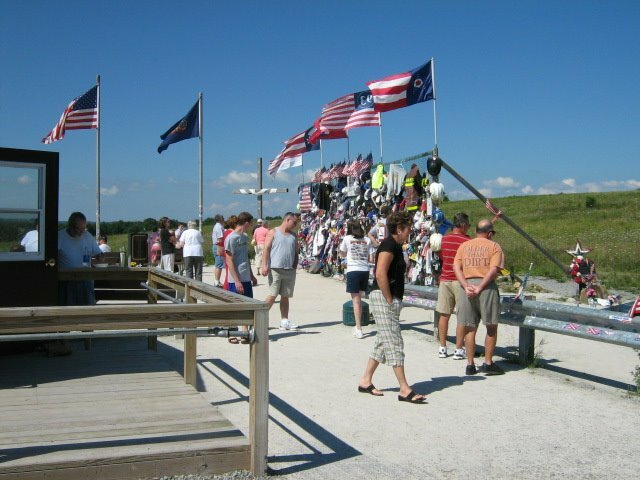 You never forget. I will have to say though that she is getting a little ambitious with her thoughts on what to knit on the way to London next week. She was choosing patterns last night that I would have to think twice about. How will she manage without me sitting beside her? Shouldn't I go along? Doesn't it just make sense that she should buy me a ticket? She can't do this alone! Ok. Nice try. So, yes, I've boarded the train to FAFSA hell... again. Here is the really, really weird thing. I have a daughter who graduated college. We filled out the FAFSA forms for her for 4 years. Never a problem. Then we had another daughter start and we filled out the forms for her for 4 years. Never a problem. So the son starts last year and all of the sudden it's bad. Very bad. Seriously, his money came in on the last day. We thought we were going to have to have him sit out a semester to get it straightened out. And this was after he took a year off between high school and college already, and had finally made up his mind to do this.... and he was excited about it which was a miracle. Truly, I nearly lost my mind over it. So this year, we started early, did everything in a manner that we were sure would guarantee us a problem free experience, and it all went bad. Again. There is no explanation. And try to get someone on the phone who's helpful. You can, but it takes about 5 tries. My advice is to just keep calling back until you get someone who knows what they are talking about because the majority of them don't. I need to win the lottery so I don't have to go through this again next year. One more year of this and I'll be living in a rubber room somewhere. Send yarn.